If you are alert, you can keep from coming in contact with poison ivy, but ticks are so small they can easily grab a ride with the means of conveyance never being the wiser. Some deer ticks and Lone Star ticks may carry diseases including Lyme disease, Rocky Mountain Spotted Fever, Babesiosis and Erlichiosis. You can greatly reduce the risk of contracting these diseases by preparing for your hike in advance. For years, I have spent more time in the woods, than out. I periodically test for Lyme Disease, and have never contracted it. When I come home from the woods, I check my entire body for ticks. They grab on anywhere from the shoe laces to mid thigh. They then start traveling straight up, looking for a place to attach. Looking for them and flicking them away has become almost an unconscious act. It has been my experience that DEET based insect repellents have little effect on ticks, so use a repellent containing permethrin and follow the directions. The instructions on the aerosol can that I purchased direct the user to apply the spray 4 hours prior to donning treated apparel. Spray your socks, sneakers, and pants. People with chemical allergies should seek medical advice regarding use of permethrin. Clear tape is useful for removing ticks from clothing. Also, quick wiping with a rag and isopropyl alcohol will remove large numbers of larval ticks from untreated surfaces. Stay on paths and try not to brush against vegetation. It is common to see ticks near the ends of high grass. Inspect for ticks periodically. If you see a tick on your clothing, pluck it off and flick it into the woods. They are very “grabby” creatures so it takes a very determined flick to get them off your finger. Immediately before re-entering your vehicle, check yourself and have someone check you for ticks. To remove ticks that have attached, do not use petroleum jelly, a hot match, or other products. Use fine-pointed tweezers to grasp the tick at the place of attachment, as close to the skin as possible without crushing the tick. Gently pull the tick straight away from your body. According to the Center for Disease Control, if a tick is attached to your skin for less than 24 hours, your chance of contracting Lyme disease is extremely small. An itchy red spot always develops on me, even if the tick was only attached to the superficial layers of skin for a short time. Mid to late July the larval ticks emerge. The Lone Star larval ticks hatch in large numbers and cause hikers to have mysterious bumps that itch for weeks. People have been calling them chiggers, but every sample I have sent to Suffolk County Vector Control has been identified as Lone Star ticks. It took me a while to develop a method for dealing with them, but it is effective. Wear light colored long pants, and light colored shirt and socks. I use women’s white knee-highs over my socks, because the smaller ticks will easily travel through the thick weave of treated athletic socks. Always tuck your pants into the socks, and shirt into pants. Late last summer I treated my clothes as described above and started refreshing the paint on the yellow blazes heading southwest from the DEC 104 parking lot. The trail was nearly closed-in by blueberry and scrub oak even though several groups of volunteers trimmed the trail back in the early spring. As I walked through a portion of trail with dense lowbush blueberry plants rubbing against my pant legs I began to notice I was picking up splotches of red on my pants. When I looked closely, I realized the splotches were comprised of hundreds of tiny, dust size individual creatures. If my pants had been untreated, they would have rapidly spread out looking for skin. After a short while, they would have become so spread out I wouldn’t have seen them. If I took my pants off in the house, without first putting them in the drier, they would have spread out, and hung around until they found a human or an animal. A women broke up with a friend of mine over this. Unfortunately, for my little six legged friends (in the larval stage they only have six legs, like mites), they landed on treated pants. 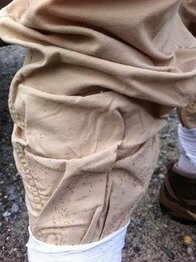 They rapidly crawled on top of each other to avoid the permethrin-treated cloth and literally dripped off of my pants. At one point my pants looked like they were splotched with red mud, but it all “dripped” off. When I returned home there were hundreds of dead “specks” in my shoes, between layers of socks and in the outer creases of my clothing, but I didn’t get a single bite. Find out from your trails organization what trails they have recently maintained. If you stay in the center of a well cut trail, you won’t pick up ticks. Often, a trail cut on either side will have a ribbon of grass in the middle. I find, when I maintain a trail, three passes with the mower, the last one in the middle of the trail is a prudent practice.